As July comes to an end, it seems fitting that I have finally finished my June meals. In June, I got a little off track with travelling a few times and hosting/attending several events. I’m glad I made my July meals a little bit later in the month, so I had room in my freezer. I also like to try everything, so I probably order more meals that I actually need in one month, but I never have to worry about what’s for dinner. Thursday was another busy day in our house, so I was glad to have Arroz Con Pollo ready to pop in the oven after I picked up Mike from work. This was a simple pan meal and the hardest part was waiting for it to be done. I unwrapped all my pieces and poured the sauce over the meal. I topped it with cheese and lightly covered it with foil. It cooked for 50 minutes at 375. I uncovered it and cooked it another 8 minutes. I let it sit for a minute or two before serving. I really liked this meal. It reminded me of something I order at a restaurant with rice, corn, beans, chicken, a delicious sauce, and cheese. I also love the clean up from the pan meals. Dream Dinners made sure we got dinner on the table again. Now, that I have finished my June meals, I am eager to work on July’s meals. I need to make sure I have plenty of room for all the wonderful items on August’s Fan Favorite menu. Even when its 110 outside, we still have to eat. Tonight, I made Toasted Sesame Chicken. I paired it with carrots and rice. I started by getting the rice going. Once the rice was cooking, I started heating up some olive oil in my new skillet. I removed the chicken from the buttermilk marinade and placed it in the sesame seed breadcrumb mixture, tossing it to coat. When the pan was heated up, I cooked the chicken for about 6 minutes on one side. Next, I added a little more oil to each chicken breast and flipped them. I cooked them another 6 minutes. I felt like the chicken still needed to cook a little bit longer so I gave it an extra 1-2 minutes on each side. While I cooked the chicken, I also heated up the dipping sauce in a small sauce pan and let it simmer about 8-10 minutes until it thickened up a little bit. When everything was done cooking, we paired the chicken with rice and carrots, drizzling everything with the sweet chili sauce. This dish was delicious. The chicken was tender and had a nice flavorful crust on it. The sweet chili sauce added the perfect splash of flavor to each of the dinner components. This meal was fast and tasty-a definite win on a 110 degree day! This was another busy week for me and I am so lucky to have Dream Dinners and Mike in my life to keep me fed. Honestly, left to my own devices, I probably would have ice cream for dinner most nights in the summer. While I was at an event on Tuesday, Mike made some delicious Savannah Grilled Chicken with Bacon Ranch Green Beans and Garlic Mashed Potatoes. We’ve enjoyed the green beans and mashed potatoes before, but this was the first time we had this chicken dish. Mike did it on the stovetop because we don’t have a grill and its hot outside. We do have a grill pan, but we sometimes have issues with stuff sticking pretty bad, so we use a skillet when possible. Mike heated up olive oil in a skillet and browned the chicken for about 3-4 minutes on each side. He added the sauce and brought it to a boil, reducing it and allowing it to simmer for 10-15 minutes. He warned me that the chicken was a bit spicy and I didn’t believe him until I ate some. While it wasn’t super spicy, most of our Dream Dinners meals are not spicy at all, so this was a little bit different. I am not quite sure why it was spicy-its been a while since I prepared the meals in the store, so I couldn’t remember what ingredients I used. I do get a little heavy handed with some spices, so I will have to keep that in mind in the future. This was another simple meal with a lot of great flavor and worked well for our busy life! Usually when we have a Dream Dinners pasta dish, it comes in a pan and cooks in the oven. However, the Italiano Sirloin Tortellini was a little different and gave cooking instructions for stovetop and crockpot. Had I paid closer attention, I probably would have followed the crockpot direction, as I love to set it and forget it. I didn’t look ahead this time, so I made it on the stovetop with no problems. I loved that this was a one pot dish, so there was not much clean up involved. I heated up my sirloin and suauage mixture in a large sauce pan and browned it about 5-6 minutes. Next, I added the marinara (minus mushrooms for us, thanks!) and brought it to a boil. Once it was boiling, I added in the tortellini, reduced the heat, and simmered about 25 minutes. We sprinkled it with Parmesan cheese and served it while it was hot. I liked this dish because it was a little different than some of our baked pastas and felt a little bit lighter. In the future, I might try this in the crockpot, but the stovetop version tasted great. This would pair nicely with one of the famous Dream Dinners breadsticks. Unfortunately, we were out of them when I made this meal. I know what needs to get added to my cooler on Friday! This was another great June meal that made plenty of leftovers for lunches, too. Last Tuesday, I had an event at Springhill Suites to attend and Mike made dinner that was waiting for me when I got home. I am thankful for day wonderful Dream Dinners meals that allow Mike and I to have simple, healthy dinners each night. Mike started by preparing a pan and preheating the oven for the onion rings. He sprayed them with cooking spray and baked them for 15 minutes on the top rack of the oven. Then, he flipped them, sprayed them again, and sprinkled with salt, cooking another 10-15 minutes. While the onion rings were cooking, he heated up the grill pan on the stove top and grilled the steaks for 5 minutes on each side, letting them rest before serving. He also made some delicious Almond Green Beans. These steaks were delicious! I loved the seasoning on them. I am not really big on onion rings, but these were pretty tasty and I always love green beans! I look forward to trying these steaks again and I know that the meat could be repurposed for tacos or nachos, too. After vacation, we finally started making our June meals. On June’s menu, I finally started seeing meals that we’ve already made before, which has cut down some on blogging for me. However, this has also been a busy month and I am a bit behind. With July’s meals being assembled this week, its time for me to get cracking on my June meal blogs to share some more amazing meals. First up is the delicious Green Chile Chicken Tamale Pie. I had tried this a few times in the store as the appetizer, so I knew we were in for a treat. This meal was different from a lot of our meals in that it was similar to a casserole, which most of Dream Dinners meals are not. I preheated the oven and prepared my baking dish. I spread the batter evenly in the dish and baked for about 15 minutes until the batter had formed a crust. I used a fork to poke holes in the crust and then poured the red sauce on top. Next, I added the seasoned chicken and cheese blend. I baked another 15 minutes until the cheese was nice and melty. I allowed the dish to cool for 5 minutes before serving. This meal was very hearty and tasty. It definitely made more than 3 servings (at least Jen sized servings!) so there was plenty for lunch the next day. 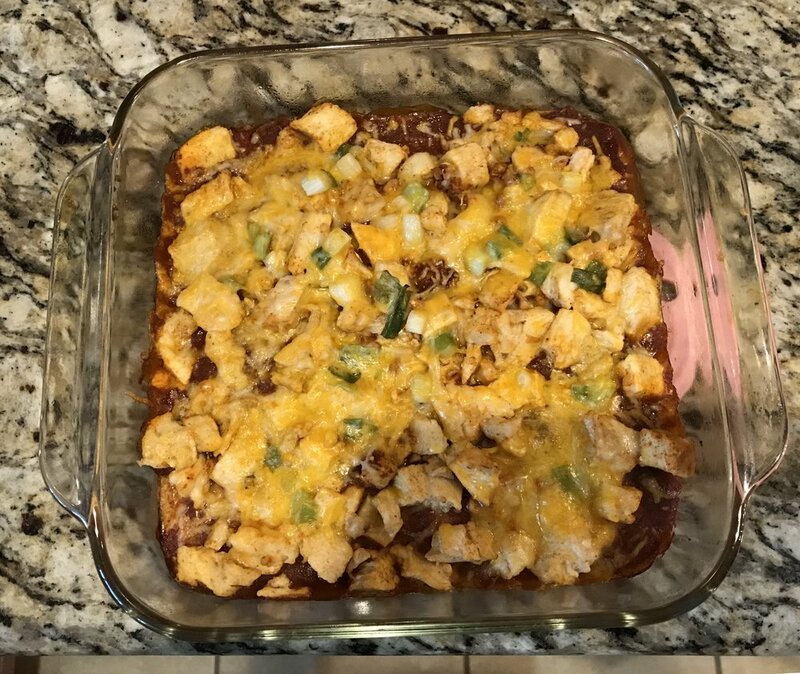 We love all things Tex-Mex, so this was a big hit in our house. We enjoyed ours as prepared, but you could add a dollop of sour cream if you wished. This is definitely one of those meals that I wished I had ordered more than once. I can’t wait to see it pop up next time! 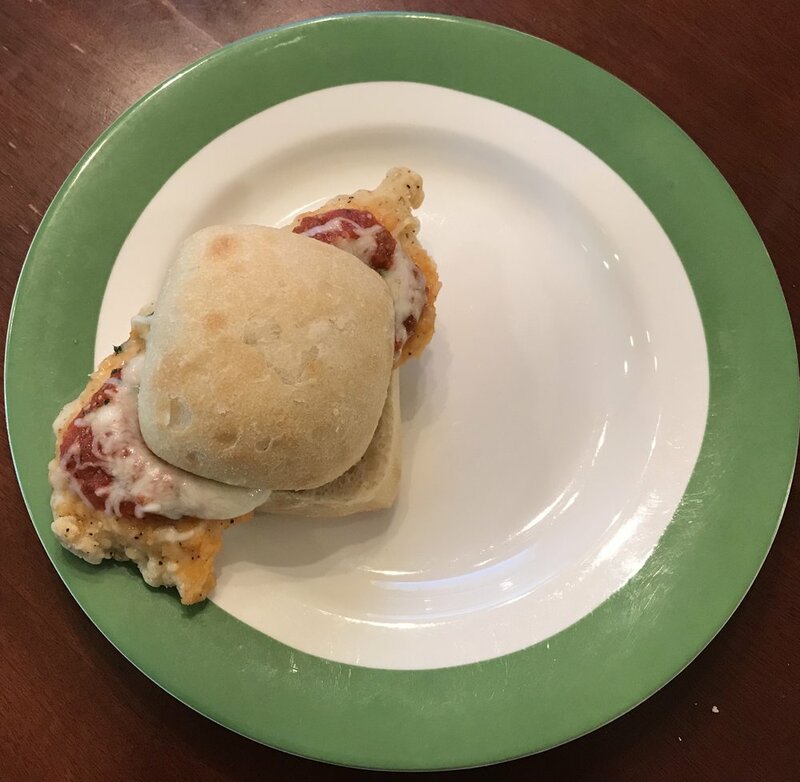 For our last May meal, we made the Parmesan Chicken Sliders. I would have thought this was something we tried before, but apparently not. I preheated the oven and prepared my baking sheet before baking the chicken pieces for about 13 minutes. After baking, I added marinara sauce and cheese blend to each piece of chicken and broiled it for about a minute. While the chicken was broiling, I sliced the rolls and spread garlic butter on them. I popped the rolls in the broiler and browned them. After the chicken and rolls were done, we put a piece of chicken on each roll and served them with a side salad. This was a really tasty dish and a quick way to enjoy chicken Parmesan. The addition of garlic bread to an old favorite was a nice touch. Thanks again to Dream Dinners for another quick and delicious meal! On Thursday, a group of us decided to head to the trolley that made stops in a park and then later do some shopping downtown. As we got closer to parking, it became fairly obvious that we would probably miss the trolley as parking was hard to find. We dropped off part of the group, only to realize that with all the rain, the park was closed and that we would not be able to go to the park. Katie and I followed the caravan of cars to park in a garage and were greeted by a parking attendant with the following phrase: “Beware, there is a bear in the building.” She said this very nonchalantly, as if it were a regular thing. We were slightly alarmed and slightly excited about the prospect of seeing a bear in the parking garage. We never saw the bear and eventually met up with the rest of the group at Savannah Bee Company for some shopping. We revised our plan to do some shopping in the downtown area, lunch, and later a little outlet mall shopping for a few of us. While we were shopping, we found clever signs, visited a Paula Deen store, and had some delicious local coffee from a delightful woman at Burg Coffees. Most of us did more looking than buying while downtown. After a bit of walking and browsing, we were done and decided to have some margaritas with a side of lunch. We walked back to No Way Jose’s Cantina, which was close to where we parked the cars and got the seal of approval of one of the parking lot attendants that Katie and I walked with, so we felt good about our decision. We had a little bit of a wait for our party of 7, but we were ready to order once we were seated. We all ordered margaritas and sangria for one last celebration before we had to think about packing up. Our charming waiter convinced me to order the large frozen strawberry margarita because they used real strawberries. It was a giant delicious treat that some family members had to help me finish because day drinking is rough. After the downtown area, Katie, Teresa, Mom and I went to the outlet mall to get a new work bag for Katie and to stop by Krispy Kreme’s for Teresa. While part of the group was downtown, Mike stayed home to watch World Cup Soccer and Bryan chilled in the basement. Dan, Sue, Jared and Aaron took a trip to Clingman’s Dome, the highest point in the Smoky Mountains. Unfortunately, it was a rainy, humid, foggy day and the views were not quite as amazing as they had hoped. Apparently, good times were had climbing to the top and watching a particular squirrel. That evening we enjoyed leftovers from all the delicious meals we had made earlier in the week. We spent more time as a family playing Tenzies and we all got packed and showered, as we were [lanning on early departures in the morning. On Wednesday, we made plans as a family to wake up early to get breakfast. There were several famous pancake spots, but for whatever reason, we decided to go to Crockett’s Breakfast Camp and I am glad we did. They were known for their giant cinnamon rolls, which for many in our party beat out pancakes. We could smell the bacon as we walked down the street to the restaurant. We were a party of 15 so we did have to wait a little bit to be seated. During that time, most of us had time to decide what we wanted and change our minds several times. I like to create my own breakfast options, as I am not able to eat eggs, and I went with bacon, grits, and a giant cinnamon roll. We ended up with several people ordering giant skillets of food, some ordering pancakes and other breakfast delights, and so many cinnamon rolls. They were some of the best cinnamon rolls I’ve every had and certainly the largest. They also tasted great the next day as leftovers. After breakfast, I headed to the outlet mall with Sallie and Teresa to check out the Kate Spade outlet for a new work bag and to Chico’s to see a cute dress that Mom thought I should try. I ended up with a cute bag and dress without spending much money at all. Part of the gang checked out a visitor center and got to stop and look at some views. They also met up with my Great Aunt Sally and Bill, who visited with us that day. We spent most of the day visiting with Sally and Bill on the porch, which was the perfect size and had tons of rockers for us to enjoy. We borrowed Sally and Bill to get some shots of the whole family, including flat Brendan, who wasn’t able to join us on our trip because he had a big test to study for. It’s also fun to point out that all 4 (present) cousins are sitting at approximately the same height. I look like I am only a little bit shorter than the others who all sit at about the same height. In reality, Katie and I are almost exactly the same height with Jared and Bryan standing 6-8 inches taller than us. It just goes to show which cousins have the “Edwards legs” and which do not. While we were a little bit late, we took this opportunity to sing “happy birthday” and celebrate PopPop’s 80th birthday! We ended the evening playing Tenzies, a fun dice game. It was fun teaching everyone a game that was pretty easy to understand and play. Bryan won a lot and made sure that none of the rest of cheated. We took it easy on the rest of the family and decided not to make it a drinking game like we did in Destin. Tuesday was our first full day of vacation and our group split into multiple groups depending on interest. Dan, Sue, and Jared headed out to Cherokee, NC for the day. Mom, Teresa, Tammy, and Sallie decided to hit the outlet malls. Dad, Mike, Katie, Aaron, Bryan, and I decided to go to lunch and Ripley’s Aquarium. We drove to a few places before settling on Landshark for lunch. We decided to do vacation right and started with a bit of day drinking, World Cup watching, and some delicious foods. After lunch, we headed to the aquarium. It had some pretty good reviews and the majority of our family really enjoys going to aquariums so this seemed like a good option. It was a good sized building and had several areas of interest for us to browse. We enjoyed checking out fish, sharks, and of course, the penguins. We watched one particular penguin for several minutes as he grabbed large rocks and carried them to a girl penguin who was hiding in a cave. After the aquarium, we stopped by the grocery store to pick up some beverages and other needed items before heading back to the cabin. The shopping gang had a lot of luck and found all kinds of treasures and deals. Dave must have been a good boy-he got a new shirt! We had decided as a family that we would eat dinners in the cabin as a whole family and that each smaller family group would take turns making dinners. Some of us missed the first night, when Teresa and PopPop made lasagna. On the second night, Dan, Sue, and Jared fixed us Taco Tuesday with chicken and beef tacos and all the fixings. It was delicious and people made tacos, nachos, and salads using the chicken or beef. As if we hadn’t eaten enough, some of us decided that we needed to go to Maddog’s Creamery and Donuts. Ice cream and donuts are two of my favorite things so I couldn’t say no to this adventure. There were several options of ice cream or donuts, but Katie and I are champs and knew that we needed both. So, we each ordered an ice cream donut sandwich with cinnamon sugar donuts and espresso ice cream. It was huge and delightful and sadly, there was no way I could finish it. Ice Cream + Donuts = Yes, please! After our ice cream snack, we headed back to the cabin for an evening of relaxation, imbibing, and games. It was fun to stay up late playing games with the cousins, who we don’t get to see nearly enough. This year’s family vacation brought an entirely new adventure. We not only had our immediate family of 6 (my parents, Katie, Aaron, Mike and I), but we had a multigenerational extended family vacation that included grandparents, aunts, uncles, and cousins, too. We made it a family vacation and a celebration of PopPop’s 80th birthday. Some of us flew, some drove, but we all managed to get to Gatlinburg, Tennessee for several days of family, fun, and food. Mike and I started our trip early to the airport in Austin, where we would be flying to St. Louis and meeting up with Aunt Sallie and Bryan. From there, we would all fly to Nashville and drive to Gatlinburg. Our plans got delayed a bit by weather all over the country and both of our flights ended up being delayed. This allowed us plenty of time to lunch in Austin and later have a toasted ravioli snack at the St. Louis airport Pasta House. We got a much later start on the road than we had originally expected. We loaded up our luggage and headed for Gatlinburg with Sallie as our captain. Normally, the drive would have been beautiful, but the sun did not shine and it rained or tried to rain nearly the entire trip, starting with our road trip to Gatlinburg. We enjoyed DJ Bryan introducing us to new music, rocking out to 90’s hits, and several car games. No road trip would be complete without a misturn at some point (in our case, heading to Chic Fil-a) and taking much longer than originally anticipated. Every time we checked, it seemed like we were still pretty far from our destination. We may have forgotten that there was a time change between Nashville and Gatlinburg, but that car ride lasted forever. As it got darker, our driver got a bit restless and very slap happy. It’s a rare thing, but our driver kept asking if we “were there yet?” We finally got to the “strip” area that connects Pigeon Forge to Gatlinburg, stopping for a much needed donut treat before making our way to more mountainous area. We managed to get to the property management office for our rental home, but got a little twisted around before reaching our destination of “Eight is Enough.” It was dark and we were tired when we finally arrived. As we pulled in, we were greeted by PopPop, Teresa, Mom, Dad, Dan, Sue, Dave and Tammy, who all stayed up to see us. We went to our assigned rooms and were ready to hit the sheets, so we would be well rested for the next day’s adventures. Before we left for vacation, I worked really hard to make sure we had eaten all the leftovers and that we didn’t have much food in the house. So, we had to go out to eat and we decided to try a new place in Leander, called Burnt Kitchen. It had pretty good reviews on Yelp and in the neighborhood Facebook group, so I had pretty high hopes. It wasn’t too far from us and we almost missed it, as it was tucked in a strip center, not super visible. We got in and it was interesting. It was almost warehouse style with very high ceilings and not much insulation. It was very loud and there were lots of families with small kids that night. We glanced at the menu, placed our order, and waited for our food to arrive. Unfortunately, I had a huge headache and the volume was not great for me, so I was pretty eager to eat and leave. I picked the grilled cheese sandwich, which was good, but weird. The Texas toast was great, but the cheese was very chewy. I did enjoy the crispy house chips. 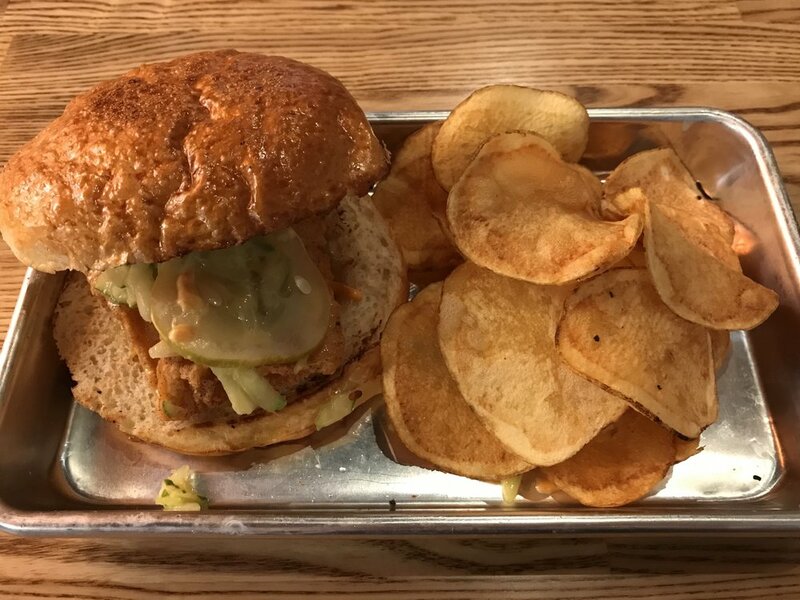 Mike tried the spicy chicken sandwich, which had tons of pickles, so I didn’t try it. Overall, we were a little underwhelmed by our experience. I would be willing to give it another chance as I wasn’t really feeling great and their brunch menu sounded pretty tasty. Overall, I would say 3/5 stars with the hopes of improvement. I enjoy a good party and hosting friends, so I have enjoyed hosting friends this year as we have started having guests monthly and now bimonthly for D and D sessions. It’s always my goal to find food that can feed a crowd and now in the summer, doesn’t heat up the entire kitchen. I am working on perfecting some summer crockpot meals. Last session, I made this delicious Easy Crockpot Baked Ziti. This meal seemed easy and everyone enjoys a delicious baked pasta. First, I made the cheese filling by combining ricotta cheese, eggs, and basil. Next, I mixed together the jarred pasta sauce and tomato sauce. I grated the Parmesan cheese and greased the crockpot with a bit of butter. Finally, I was ready to assemble. The first layer was sauce, which was followed by uncooked penne, ricotta mixture, and Parmesan cheese. Next, I added more sauce, penne, ricotta mixture, and the rest of the Parmesan cheese. Finally, I added the end of the penne and sauce. I added the lid and cooked on high for about 2 1/2 to 3 hours. I checked it at 2 1/2 hours and let it cook a little bit longer. Then, I added mozzarella cheese to the top and cooked it until it melted. The results were a delicious baked pasta in about 3 hours. The kitchen stayed cool and I could pretty much set the crockpot and forget about the dish. It was a hit with my friends and paired nicely with some delicious Garlic Breadsticks from Dream Dinners and a toasted ravioli appetizer. This made plenty of food for 6 hungry adults with leftovers. Depending on preferences, meat or meat sauce could be added. I am so glad this turned out great-its often a gamble with online recipes, but this was a hit! My final Dream Dinners meal before vacation was French Onion Turkey Burgers on Pretzel Buns with Salt and Pepper Fries. I always love a pretzel bun, so I always make sure to order any dish involving them. I also love the salt and pepper fries because they are crispy and have great flavor. I started by preheating the oven and getting the fries cooking. I cooked the fries at 425 for about 30 minutes. I combined the turkey with the French onions and massaged until well blended. I divided the turkey mixture into 3 portions and formed 3 large patties. I cooked them in a skillet for about 7 minutes on each side. While the burgers were finishing up, I toasted the pretzel buns in the broiler. With good timing, everything finished at about the same time. The burgers were juicy and well seasoned. The French onions added great flavor and texture. There was a seasoned mayo that really paired nicely with the burgers and pretzel buns. The fries were cooked to a crispy perfection. We really enjoyed this meal and all the burgers we’ve had from Dream Dinners so far. Last week was almost a whole week of Dream DInners meals, as my session got moved up a week and I needed all the freezer space I could get. I’m not complaining because everything we had a was delicious. Our next meal was the Chipotle Chicken Ravioli. This meal was great because it cooked extremely fast! It was a meal that could be cooked from frozen, too, which is great for those nights where you forget to pull something out to defrost or your plans change. The thing that took the longest was getting the water to boil and the oven to preheat for the breadsticks. Once the water boiled, I added the ravioli and let it cook about 5 minutes. In a separate pan, I added the chicken and sauce and simmered over medium high heat for 8-10 minutes. Meanwhile, I preheated the oven to 375 and cooked the some of Dream Dinners famous Garlic Breadsticks for about 6-7 minutes. Everything was finished at the same time. I gently coated the ravioli with the sauce, added a breadstick and dinner was ready. This pasta dish was really interesting. The chipotle flavor gave it a little bit of a spicy kick. The breadsticks were perfectly cooked and flavored. I loved them so much that I decided to go back for more to serve my friends at an event. We always like the Dream Dinners pasta dishes and this was no exception. Today may be a day of many blog entries as I prepare to go out of town. I need to get caught up on all the delicious meals I’ve made and tried before I have a whole week’s worth of adventures to talk about. I just made my June meals, but I am still finishing up eating all my May meals and even further behind on blogging, so its time to get creaking. I am also excited to be using my new IPad that is even faster to get posts out. One day last week, we made Chicken Paella. I had never had Paella before, but it definitely looked a little bit like a Tex Mex or Spanish version of jambalaya. After thawing the meal, I placed the rice, meat, and sauce in a larger sauce pan, stirring to mix. I brought it to a boil over medium heat and simmered it for about 20-25 minutes. Next, I removed it from the heat, added in the peas and let it rest about 8 minutes. We really liked this dish. We love jambalaya, so we loved this, too. It had great flavor and it made a ton. This was technically a 3 serving meal, but I think that we got at least 5 meals out of it. This was another yummy meal that made great leftovers and I look forward to seeing it on the menu again! On Friday, I finally had an evening home and some time to make dinner. I decided to make the Gaucho Grilled Pork with Garlic Asparagus. I was pretty excited about this one, as one of my friends told me it was her favorite Dream Dinners pork dish and her opinions have been pretty accurate. My grill pan is not huge, so I decided that I would cook the pork tenderloin in the oven. I got my oven heated up and prepared my pan. I brushed the pork tenderloin with olive oil and sprinkled it with the dry rub. I baked the pork for 30 minutes, basting it with the chili butter every 10 minutes. We let it rest for about 5-10 minutes before slicing and serving. After the pork had finished and was resting, I turned the oven on to broil and got started on the asparagus. I broiled the asparagus for about 5 minutes, added garlic and butter, and broiled about another 4-5 minutes. Everything was ready to go at about the same time. This was a really yummy meal. The pork was perfectly cooked to a tender state and the flavor was amazing. I loved the chili butter. I don’t love asparagus, but the flavor was pretty tasty and I finished my portion. Mike really liked the asparagus and said that it was cooked well. I also used some of the leftover pork to make nachos and they were pretty amazing, too. I can’t wait until the Gaucho Pork is back on the menu-I will definitely be ordering more than one next time! Last week, there were a few days where I had events so Mike and Dream Dinners took care of feeding me. On one of those nights, he prepared Chicken Florentine with Sausage. I had tasted it briefly as the appetizer in the store. Mike preheated the oven and prepared the pan. He put each chicken breast in the baking dish and covered each piece with the sausage topping mixture. He covered the chicken and sausage mixture with bread crumbs and baked for 30 minutes. While the chicken was cooking, he made some pasta. In a separate pan, he simmered the pomodoro sauce for 15 minutes. When everything was finished, he drizzled it all with pomodoro sauce. This dish was simple, but very flavorful. The spinach and sausage mixture was really tasty and paired nicely with pasta. It reminded me a little bit of something we made before with breaded chicken and spinach artichoke dip, but this was much easier and healthier. Once again, Dream Dinners took simple ingredients and created a unique and tasty meal.